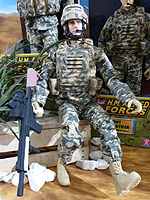 The HM Armed Forces toys on display at London Toy Fair 2013 were mostly, with a few exceptions, repaints and reworked variants of toys that Character have already released. Anything new planned for the HMAF Character Building range was held in reserve. The Army Tactical Battle Tank was fielded in a new single desert sand colour, rather than the multi-coloured desert camouflage livery already seen. Of most interest, however, were the new and reworked HMAF Action Figures. The packaging for the figures looks to be getting a makeover, though what was on display was most likely mock ups rather than final approved releases. 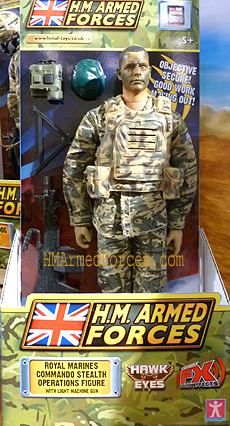 The new Royal Marines Commando Stealth Operations Figure was the star of the show. The Stealth Operations Figure features the excellent Hawk Eyes and Combat FX Sound Effects. The figure, in MTP and face camouflage, comes with a Light Machine Gun, detachable tripod, Green Beret and Night Vision Binoculars. Also mentioned in dispatches was a Royal Marines Commando, as previously released, but now in new MTP Multi-Terrain Pattern uniform. Another brand new action figure on show was the long-rumoured RAF Close Protection Officer, again in MTP uniform. The Close Protection Officer figure comes with an MP5 Machine Gun, removeable helmet and pistol. The Army Infantryman on display looked identical to the earlier release, but now re-released with MTP uniform and a must-have new Sharpshooter Rifle accessory. Crawling Infantryman and RAF Police Dog Handler were also on parade though these have already seen retail service in 2012.